At the time of our Old Testament story, it’s been two years since the people of Israel left slavery in Egypt. It takes about a week to walk from the eastern border of Egypt to the land of Israel, but they have been wandering for two long, hard years, walking through the desert wilderness, chasing a promise from God that they would someday reach the Promised Land. The reason the road to the Promised Land is long and hard is that it is the road on which they are being changed into men and women of faith. Like the people of Israel, our life, in many ways, is a journey through the wilderness. We have needs: we may face illness, our health is challenged, we may face unemployment, we may wonder if we will have enough, we may fall into despair, our relationships can become arid and dry, our work can become dull and meaningless, and our heart can become broken by the losses of life. You didn’t get into the wilderness because you wanted to be there. Nobody chooses the Wilderness Road through life. But sometimes we find ourselves there, and we are being changed. And the greatest change is that we are learning to depend only on God. Faith is sometimes discovered in the wilderness. To be clear, the faith that we are learning in the Wilderness is not faith in ourselves but faith in the faithfulness of God. It was God who parted the waters of the Red Sea, who miraculously provided water and food in the desert, and who forgave the people’s rebellion and complaining. Step by step, day after day, the people of Israel received one reminder after another that they could count on God, trust in God, to be faithful. Our life, in many ways, is a journey through the wilderness. And so often, the challenges in life only seem to increase. Maybe the greatest challenge of all is having the faith to trust in the promises of God – the promises God made to you in your baptism, promising to love you as his beloved child, promising to forgive you, promising that he has a sacred purpose for you, promising that, with his help, you headed for a future filled with hope. The purpose of the journey is to be transformed into a people of faith, hope, and love – people who are ready for the future God has for us. The danger is that we become so fearful of the world around us that we forget the dream God has for us. This is God’s dream for us as his children. After two years of the desert journey, God finally brought the Hebrews to Kadesh, which is the southern entrance to the Promised Land. The Lord told Moses to send twelve of his leaders as spies into the land. Forty days later these men returned from their intelligence-gathering mission and brought back pomegranates, figs, and a cluster of grapes that was so big they had to carry it on a pole between two men. That was the opinion of 10 of the 12 spies. But the other two spies, Caleb, who we hear about in our reading, and Joshua, who is mentioned in the verses that follow our reading, responded with a minority report, with words to this effect: ‘Do not be afraid of the giants! Trust in God! So, what did Joshua and Caleb see that no one else did? Well, They saw the promise, God’s dream for them – and that changed the way they saw everything else. It changed the way they saw the giants and the way they saw themselves. Going back to Egypt wasn’t an option because these two men did not think of themselves as slaves any longer. They simply had seen too much of God’s faithfulness. Here’s what we need to realize from the Old Testament story: Nothing will shape your identity, and your life, more than the promises you believe. But the Bible claims that our identity is determined most of all by the promises we believe. If the promise we believe is that we are on our own to make what we can of life and on our own to get through the wilderness, then when we stumble onto the giants, we may just be reminded again that ours is a society that devours its inhabitants. 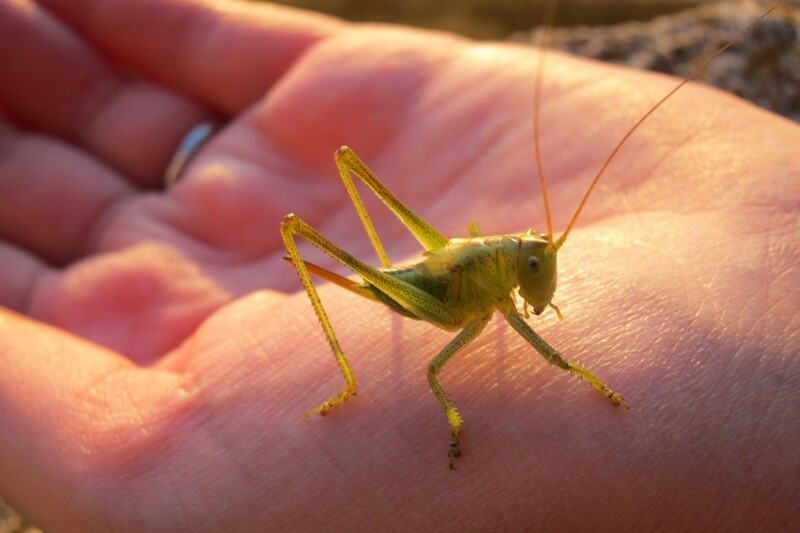 We will live in fear that we are just a grasshopper. But, if the promise we believe is the promise that God made to us in our baptism, promising to love us as his beloved child, promising to forgive us, promising that he has a sacred purpose for us, promising that, with his help, we are headed for a future filled with hope – then we need never be consumed by fear. When we run across the giants, we are reminded that the giant isn’t in our way but in God’s way. And they don’t make giants big enough to keep God from getting what he wants. We see that in our gospel reading. The Roman Centurion shows his understanding of authority. He has soldiers under his command who do what they are told to do. And this Centurion believes that Jesus has that kind of authority over illness and death. This story points us forward to Jesus’ resurrection from the dead, the empty tomb, which symbolizes God’s power over anything that would keep his promise, his dream, from being fulfilled in this world. The story is told over and over again in the New Testament of the Bible of Jesus power over sickness, sin and death, and that in him, we too will share in his resurrection victory. There is a wonderful epilogue to our Old Testament story. It takes place thirty-eight years after our story today. An entire generation has come and gone. The people have learned much about God’s faithfulness. Joshua and Caleb, now older, probably about 60 years old, lead the people into the Promised Land. We don’t hear about Caleb after that except for one brief reference. After they finally crossed into the land, we’re told old Caleb fought against the giant Nephilim, and he defeated them. God kept his promise. And so it will be, for us. God will keep his promises. Let us keep our hearts firmly fixed on the promises of God.